Bigg Boss Telugu 2 week 3 elimination: Kireeti to be evicted from Nani's reality TV show? Kireeti might be evicted from the Bigg Boss Telugu 2 house in the third week, while Geetha Madhuri, Ganesh, Tejaswi Madivada and Bhanu Sree remain safe, according to IBTimes poll survey. Kireeti is likely to be evicted in the third round of elimination in Nani's reality TV show, Bigg Boss Telugu 2; while the other three - Geetha Madhuri, Ganesh, Tejaswi Madivada and Bhanu Sree - might be able to avoid elimination. IBTimes conducted a poll to gauge the audience's reaction and we have come up with a sure shot prediction. But first, let's start with what happened in the last episode. The 20th episode of Bigg Boss Telugu 2 began with a brief look at what happened inside the house on Friday. Babu Gogineni and Tanish are 'jailed' for not obeying the rules and the former was clearly not happy about being locked up. Roll Rida and Geetha are also seen having a childish conversation. Geetha Madhuri, Ganesh, Tejaswi Madivada, Bhanu Sree and Kireeti have been nominated for the third elimination round, leaving everyone curious to know who will be evicted from the house. Nani announced on Saturday that Bhanu Sree and Tejaswi are safe from the eviction this week. 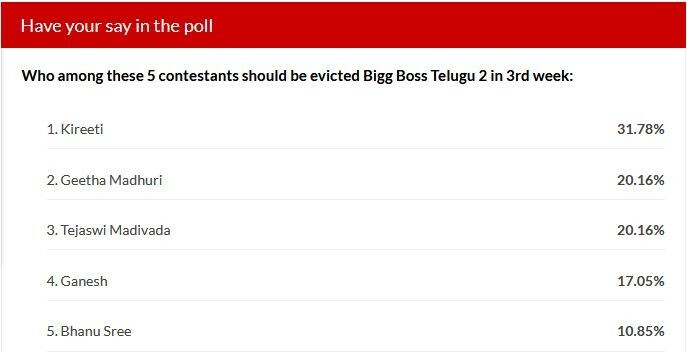 IBTimes held a poll to decide who among the five housemates should be eliminated from Bigg Boss Telugu house. In the last five days, thousands of viewers cast their votes for the contestant they dislike the most in the Bigg Boss house. Here, we bring you the vote share of the participants and details of the contestant who will possibly be shown the door on Sunday night. Tejaswi Madivada and Geetha Madhuri, who have also been nominated for the first time, have received 20.16 percent of the total number of the votes, according to IBTimes poll. On the other hand, RJ Ganesh has been nominated for all three times. Most of the housemates seem to want him evicted, saying that he is not fit for the house. Though Ganesh himself does not seem to be finding it tough to survive inside the house. However, he is the only common man in the house, while the other two have already been evicted. Not many viewers are interested in sending him out and 17.05 percent people have voted him. Meanwhile, Kireeti was nominated for elimination from Bigg Boss Telugu 2 for the first time in its opening week, but the audience had saved him. But many viewers are apparently irritated with his stint inside the house. Hence, 31.78 percent of the audience want him out of the show, according to the poll conducted by IBTimes India. However, Star Maa has its own way of finalizing the elimination, which is done through the viewers' votes received from phone calls and googling voting system. Nani will be announcing the name of the housemate who would be eliminated from the house on Sunday night.